Unwrapping the Enigma refers to Edwin as an individualist, someone with the capacity to be impatient and astringent, yet sociable and warm. Interviewees also referred to him as having a vivid imagination and the ability to work purely intuitively with little guidance and direction. Notebooks in the Olive Cook Papers show him travelling alone throughout the continent photographing for the Great Houses of Europe (1961). The East Anglian writer and historian Norman Scarfe said he had the capacity to ‘photograph with great fluency….naturally, with vividness’. Spontaneity and enthusiasm were recurring impressions as people talked about Edwin. Edwin’s approach to photography was inevitably influenced by these qualities. To complement the adjoining article by Brian Human, I thought I would add some of my own observations about Edwin Smith’s work based on my experiences in printing many of his negatives over the years. I never met Edwin, but in printing the negatives in the care of his widow, Olive, I began to feel very close to the man. Sometimes, in the darkroom when dealing with a particularly ‘awkward’ image, I found myself talking to him, asking him how on earth he got the result he did from the tonal range I was presented with. This was obviously the time to take a break and grab some coffee! 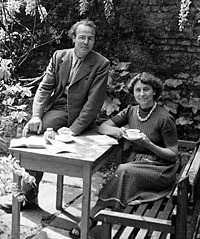 Edwin and Olive in the front garden at 29 Buckland Avenue, Hampstead, c. 1949-50. So, what of his technique? His negatives were usually of a reasonably good quality and could range from glass plates, through sheet film to roll film in format. I have his last camera, an Ensign Autorange, and a lot of his later work was done with that, producing 6×9 cm negatives on roll film. 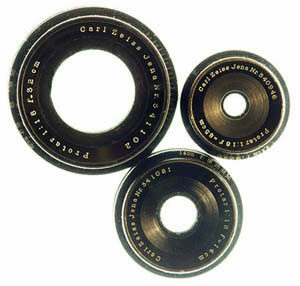 He used a variety of film types, predominantly Kodak or Ilford of medium (125 ISO) speed. I do not know what chemistry he used to process the films, but a man who mixed his own pigments to make oil and watercolour paints probably mixed his developer from basic chemicals on occasion too. I do know, from a contact who inherited some of his darkoom content, that he possessed a very large quantity of potassium ferricyanide – a chemical used for bleaching the silver in prints (or films) to reduce its density, lightening shadows and clearing highlights. This single fact confirmed something that I had suspected for some time. It was not possible to create modern prints that matched his originals by pure exposure and development alone. Partly this was because materials have changed, but it was also because – far from ‘co-operating with the inevitable‘ or ‘going with the flow‘ – Edwin Smith worked on his prints with bleach (and possibly intensifiers) after exposure and development in the darkroom. In a way, this is little different in outcome to the previsualisation techniques of technical masters like Ansel Adams. Edwin undoubtedly knew, at the time of making the exposure, what he wanted the final print to look like. He could not be bothered however withthe strict scientific approach required to translate his experience-based exposure technique (counting seconds as ‘cat one-cat two-cat three..’ etc) into a developed negative and subsequent print that matched his intention. What he did havewas the knowledge and tenacity to work on the end result, by whatever means was necessary, to achieve his goal. He was not averse to racking the rising front of his view camera to beyond the usable image circle of the lens, just so he could get the top of a particularly dramatic church steeple in shot. Similarly, as the cover image of ‘English Abbeys & Priories‘ illustrates with its blurred church tower and treetops, his use of camera movements was at times a bit ‘casual’. In general though his rendering of scenes was excellent. His technique was in most cases more than equal to his vision and intention. I am fortunate to also own the lenses he employed on his Thornton-Pickard Ruby camera; Zeiss Protars, made around 1912 and highly sought after even today for their almost total lack of astigmatism and curvature, coupled with an extraordinarily large image circle. Edwin had published ‘All the Photo Tricks: ways and ideas off the beaten track’ in 1940 at the age of 28 and so obviously had a pretty deep knowledge of all that was possible with cameras, lenses, light, materials and chemicals. This in-depth knowledge is somewhat at odds with his life-long avowal that he was only a photographer ‘by necessity’, as Brian mentions. 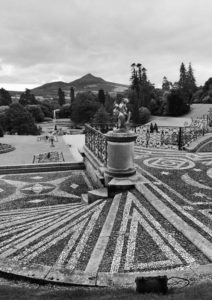 In 2010, I visited the location of one of Edwin’s photographs taken in Ireland (Powerscourt, shown below) and attempted to recreate it. You can read about the experience in a blog post here. However, Mrs Horwood argued that when Edwin travelled to Venice and on arriving found the place was flooded, he treated it just as another trial and tribulation of travelling, something that was sent to plague him, he didn’t look at it with a journalistic eye, as a story that was worth recording. Edwin’s natural creativity and spirit of independence lead him to work almost always as a freelance, usually commissioned independently or to work with a writer. His relationships with writers appear to have been mixed. 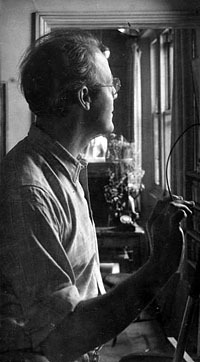 Olive Cook claimed he ignored the writers he worked with, in the sense that he didn’t really take a lot of notice of what they requested him to do. He just went ahead and photographed what he felt was important. Mrs Horwood recalled talking to Olive about this. Norman Scarfe has a much more positive recollection of working with Edwin. Scarfe was confident in giving Edwin a brief and letting him get on with it knowing that the result would be first class. Scarfe recalled their working together. However, he was always willing to lay the camera aside for the pencil and paint brush, in John Henderson’s words, ‘one felt that the camera was put away, was shut away, at the end of the day’. Edwin invariably worked with available light and was economical and organised is his approach. Mrs Horwood felt, ‘there was, well certainly with the landscape pictures, a great element of selection.’ Olive Cook said that Edwin’s way of printing, or way of photography, was to get the final print as close as possible to the image that moved him at the time the picture was taken. Edwin carried back with him to the darkroom an image of how he felt or what he saw at the time and then worked on the sometimes rather unsatisfactory negative or print to produce that effect, rather than working from a perfect negative that stemmed from exact exposure and processing determined at the outset. Edwin married his personal qualities to an acute and voracious visual appetite and a way of working that suited both. But if he photographed what he wanted and did things his way he was never a dilettante. Correspondence and notes in the Olive Cook Papers show Edwin making careful plans for his phoptgraphic excursions and taking great pains to get permission to obtain access to the buildings he wanted to cover, permission that was usually granted. And when he travelled he went fully prepared: flying to Italy in 1960 to photograph for the great houses project he incurred £10. 4s. 2d (around £172 today) in excess baggage charges. Edwin’s natural energy translated itself into hard work, as many interviewees testified. Mrs Donald Horwood: ‘he was very much an autodidact and got his qualifications through sheer grit and hard work’; Phoebe Pickard4: ‘Tremendously hard working – everything else could go by the board’….he was single minded once he took a job on’;and Norman Scarfe: ‘He worked very hard’. The recorded itinerary to photograph for the Great Houses of Europe in 1960 demonstrates the point. March 14th – April 8th, Italy – Milan, Stupinigi, Turin, Stresa, Mantua, Verona, Venice, Treviso, Maser, Mason Vicention, Blogna, Urbino, Viterbo, Bagnaia, Bomarzo, Caprarola, Rome, Tivoli. April 17th – 28th, Spain and Portugal – Madrid, Aranjuez, Seville. May 16th – June 3rd, south Germany and Austria – Munich, Wurzburg, Bamberg, Pommersfelden, Vienna, Schwarzenberg, Innsbrook, Schwaz. June 27th – July 11th, France – Calais, Paris, Versailles, Vaux-le-Vicomte, Auxerre, Chateaudun, Blois. August 1st – 24th, ‘North’ – Brussels, Ghent, ‘Holland’, Dusseldorf, Benrath, Koln, Bruhl, Copenhagen, Svendborg, ‘Sweden’, Berlin, Potsdam. But it was more than just hard work. These records, comments, views give some insight into Edwin Smith the photographer and, although they are partial in both senses of the word, they allow us to offer some tentative conclusions. First, Edwin the photographer and Edwin the man are indivisible – his character influenced his whole approach to photography. His pictures embody his individuality and his warmth; his relationships with his collaborators and the people he met during his work were shaped by both his sociability and his impatience. Second, his work was driven by a curiosity about the world and a voracious visual appetite for everything from the grand to the ephemeral, an appetite that enabled him to see and photograph his chosen subjects in ways unique to him. He showed one world in the big picture and another in the details and merged the two on the printed page to reveal places anew. Third, technically his approach was a combination of the simple and the complex – simple technique in the field using the right equipment for the job (‘cooperating with the inevitable’) and complex work back in the darkroom to achieve the required print. The creativity was innate, but he also mastered the craft of photography and was more often that not a perfectionist in its execution. Fourth, he worked hard, was passionate about photography and had a justified sense of his own worth, despite his protestation that he was a photographer only by ‘necessity’. Photography was an essential and enduring part of his life. Friend and supporter of an artistic community in Southwold. A family friend who knew him from her early years. John Henderson’s parents were friends of Olive and Edwin; Edwin photographed John as a baby. Arranger and adaptor for the first production of Gordon Jacob’s Job, on which Edwin assisted in 1966. Psychiatrist, medical campaigner, conservationist and pioneer in the movement against nuclear weapons.